Imagine sitting soaked in another man’s urine for close to an hour. Toronto FC’s Jozy Altidore — and maybe a few prisoners of war — have suffered though just that. His most recent memorable fan moment lasted all of a few seconds. After converting a game-sealing penalty kick in a 3-1 win over the Whitecaps in Vancouver on Saturday, the U.S. international jogged toward local supporters to taunt the 21,000 in attendance. In front of him stood Kirsty Olychick, who did what many self-respecting supporters do: She raised a finger. And she kept it up just long enough for a local photographer to snap what will likely go down as the photo of the year in Major League Soccer. “I saw it online,” Altidore said by phone on Monday. “Someone asked what I thought. I thought it was cool. It was so good it instantly made the rounds on social media the day after the game, garnering massive publicity as outlet after outlet posted it to the web. It was posted to Twitter tens of thousands of times and was the most-searched MLS item online. “I don’t think he even noticed I was doing it, nothing was said to me at the time,” Olychick told the Sun by email Monday. She just might get that chance. Altidore’s people are hoping to get in touch with Olychick this week to thank her for one of the most memorable photos in the Toronto FC striker’s collection. “It’s up there, man,” Altidore said in terms of images he has seen of himself. It’s the only one that compares, apparently, showing Altidore soaring through the air before landing on the dog pile after Donovan scored a stunning game-winner against Algeria in South Africa. This time, though, the photo was a result of Toronto FC’s newest striker adding to his goal haul. 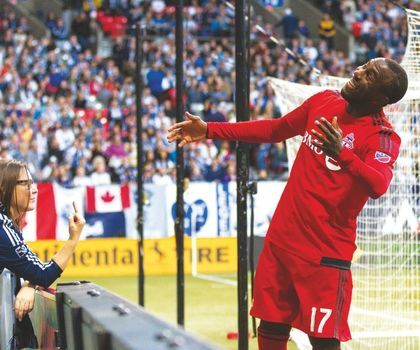 In the moment, Altidore said he didn’t recall seeing a much-smaller Vancouver fan holding up the one-finger salute — likely because he was dodging flying objects. Or attempting to hug her, I added — to which Altidore let out a brief laugh. “She’s awesome,” he continued. “I know that it’s nothing malicious. For Olychick, it was just habit — one that turned her into an instant online star. All told, Altidore will likely take a finger over a bag of something more sinister any day.